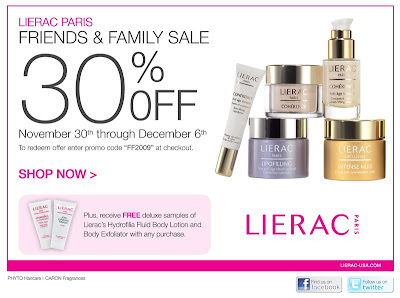 Lierac: Friends & Family sale of 30% off from November 30th through December 6th 2009. The online code is FF2009. J Crew: 20% off sweaters plus FREE shipping on orders over $150. Code is HOLIDAY. Online only. Mackage: Sample sale in NYC! Mackage Holiday sale from December 15th through December 17th 2009 at 275 West 30th street, 7th floor. The hours are 11am-7pm. This is a set that features 4 flavored lip glosses. The lippies are housed in metallic tins with a cupcake wrapper. The set has a high adorable factor. The flavors are Truffle, Caramel, Chocolate Orange, and strawberry cream. The glosses are ultra sheer and leave just a tint of color. The Chocolate Orange lippie is a shimmering copper while the Caramel is a sheer bronze shade. The texture is smooth and light. It feels very moisturizing. The glosses are formulated with natural ingredients such as seed oil, known for its antioxidant benefits, and jojoba seed oil which is great for hydration. The flavors are true to life. The strawberry cream is bursting with realistic strawberries and a dollop of vanilla cream. The truffle is a deep dark chocolate with no bitterness. The caramel is burnt butterscotch/caramel. The chocolate orange has an incredible burst of orange zest. They taste as good as they look. The taste is realistic with no plastic or weird undertones. Consumers can contact a toll free number to find a Jane Iredale location near them! In celebration of NARS’ 15th Anniversary, François Nars will make a special personal appearance at Barneys New York to sign copies of his new limited-edition book 15X15. Barneys Creative Director, Simon Doonan, who will be hosting the signing, wrote the clever forward to this book. 15X15 features a collection of 15 celebrity portraits, each inspired by a NARS product shade and based on an iconic reference chosen by François Nars, who personally did the makeup and photographed each portrait. Fifty 15X15 books will be available at this signing with 100% of the sales being distributed equally among the 15 charities chosen by the participating celebrities. The 15 celebrity portraits will also be displayed throughout the Barneys cosmetic floor during the signing. Additionally, in commemoration of the anniversary, NARS’ two limited-edition 15th Anniversary Palettes, Wild At Heart and Everlasting Love, boasting ten best-selling shades will be available. 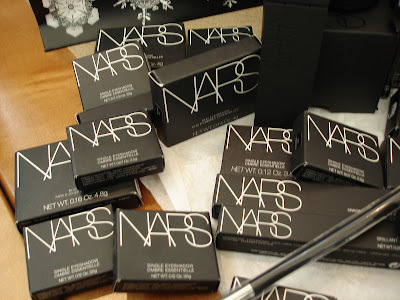 And, the NARS Loves New York Set, containing an assortment of four classic shades resurrected from the archives by François Nars specifically for the women of New York and re-named after iconic names in the city, will also be available for sale. A talented team of NARS makeup artists will also be offering customers in-store consultations with the NARS Loves New York Set, 15th anniversary palettes and Holiday collection. Olay: Regenerist or Total Effects skin care are priced at $18.99. This excludes kits. 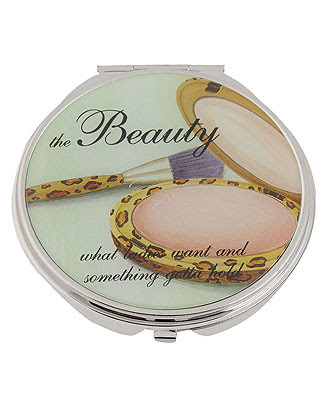 These compacts are from Forever 21. I am going to hazard a guess that Guerlain is not aware of this compact. Beauty-full Black Friday bonus you won’t want to miss for Beauty Insiders only… *Free Kat Von D Tote* Get a limited edition tote adorned with studs and sketches of celebrity tattoo artist, Kat Von D’s, with a purchase of $25. 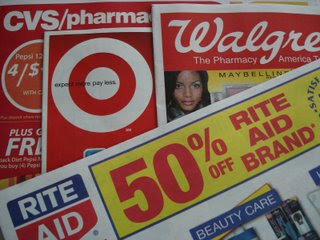 Valid online with promotional code TOTE09 and at checkout in stores with printed page. *CyberMonday* Enter code SHIP4FREE in the promotion code box at checkout to receive free standard shipping on your online merchandise order. Not valid in Canada, retail stores, or on previous purchases. Cannot be used in conjunction with other promotion codes. 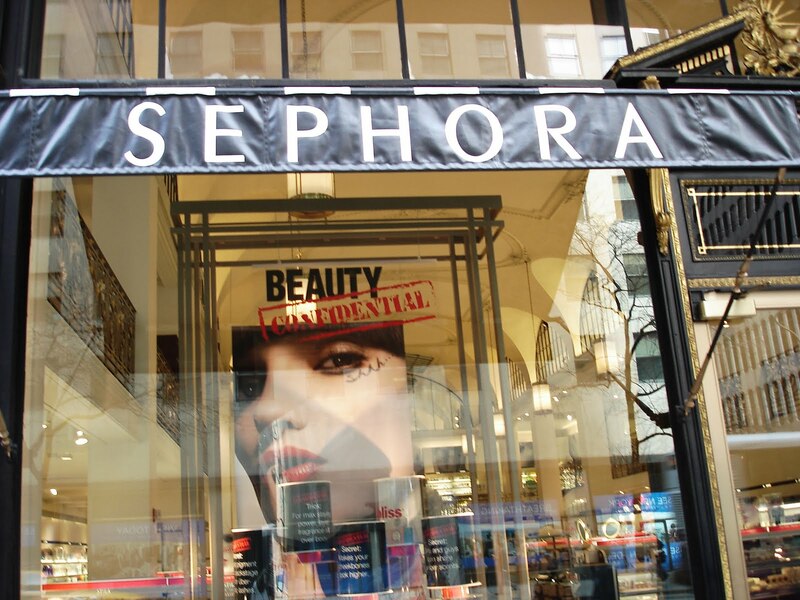 Sephora reserves the right to rescind or change this offer at its sole discretion at any time. This offer is valid from November 28th through November 30, 2009 at 11:59 p.m. PST/PDT. Plus, you can “share” your wish on Facebook and receive one of three deluxe samples, including YSL Black Mascara, Philosophy Inner Grace Body Lotion or Mini Nars Duo Lipgloss. 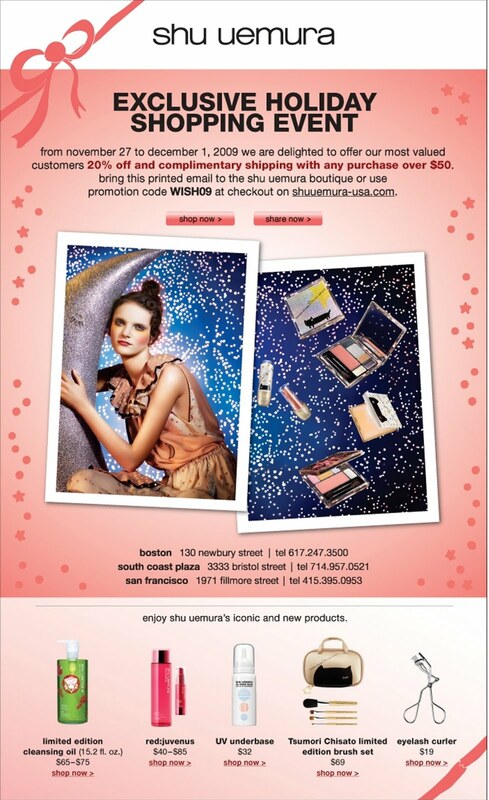 To get your glamorous goodie, enter any of these gift with purchase codes: WISHME, Claus, or Clause. 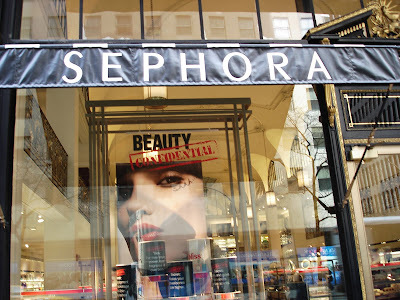 For more Sephora Claus details, visit http://www.sephoraclaus.com/. You must be 18 or older and a US citizen to win. Prizes must be found on Sephora.com and less than $150. 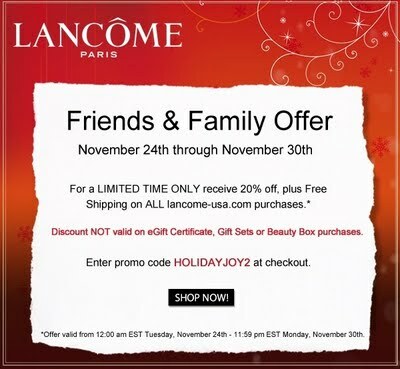 Lancome online Friends & Family ends November 30th 2009. 20% off and FREE SHIPPING is magnificent. The checkout code is HOLIDAYJOY2. Let us know if you cave and happy shopping! Enjoy free shipping and 20% off purchases of $50 or more made at www.shuuemura-usa.com. Enter the promotion code WISH09 upon checkout. Enter the promotion code WISHDELUXE09 upon checkout. There is a thunder in my heart for the Sorceress palette. As a snow miser and Erika F fan girl, this palette was the one for me. White Rabbit is a frosted white shade. Edge of Dark is a silverish heather gray. Magnetized is a cold lavender. It is hauntingly beaultiful. This is the shade that I lost my mind over. Hypnotizing is a mouse-like taupe with a mauve cast. Very cool. Altered State is a blue violet. Heavy on the violets. This is the warm "heat miser" palette. This is aptly named Devil May Dare. It is all toast and peachy. Oh My Darling is straight up cream. It photographed with a pink cast...but that is not the case. Dare Ya! is peachy pink. Heavy on the pink. Gold Tease is a muted, non metallic, low wattage frosty gold. Highly wearable. Prankster is a muted olive with a gold cast. Devilishly Dark is a rich hazelnut brown with some gold shimmer. The palettes retail for $36 and are currently at your local MAC counter. I have found that palettes are actually a great gift for the holiday season. Giftees react in a positive way. My nail tech still raves about her MAC palette from two years ago. These 2009 palettes feature useful and stunning colors for various skin tones. The packaging is festive and has a cool factor. 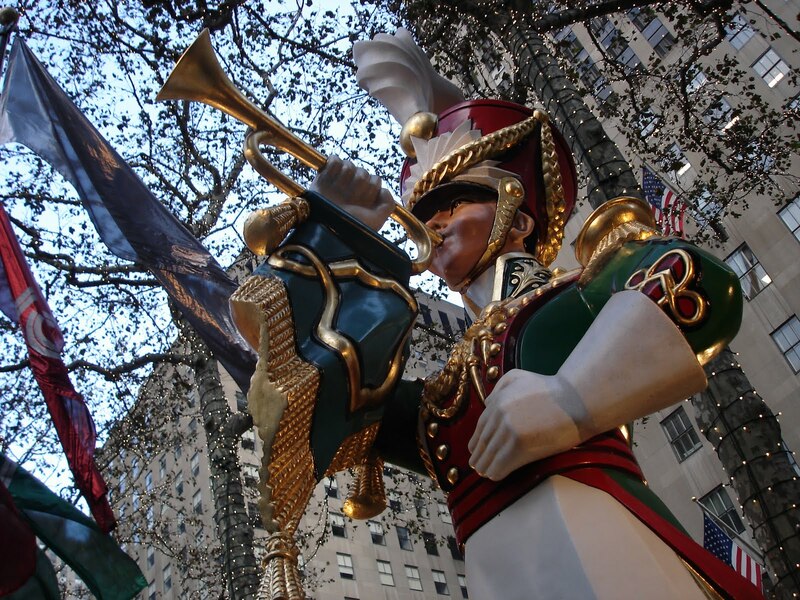 The Bergdorf Goodman’s Holiday Windows debuted on November 20th. The windows are available for swooning until January 6th 2009. No offense to the fine folks at Barneys...but Bergdorf windows are just magnificent. The theme of this year’s windows, “Curiouser and Curiouser” is inspired by the imaginative works of Lewis Carroll, author of Alice in Wonderland and Through The Looking Glass. and by friending Bergdorf Goodman on Facebook. 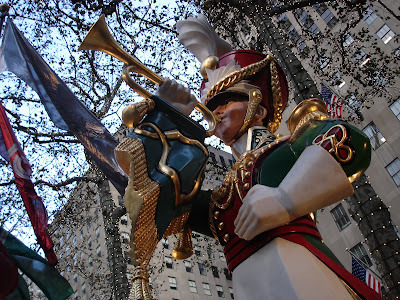 Here are a few pictures from a past Bergdorf Goodman window. Excuse the quality. They were done by me with a digital and shaky hands. It was cold. I purchased these lip glosses based on their shimmery goodness. I was dazzled by their spark and fire in my local Sephora store. The lippies are made from crushed sea pearls, vitamin E and peppermint extract. The pigment is fairly sheer but the glitter power is high. I prefer wearing these lip glosses solo and not layered with any lip products. The glimmer gets lost. They are non-tacky and feel very moisturizing. Shell is a blush pink with hot pink glitter. It is a less intense and slightly pearlized version of Chanel's Astral Glossimer. Pink Bling is a muted, sheer, lavender pink opal jammed packed with fine hot pink glitter. It made me lose my mind. Disclaimer: I purchased both these lippies at my local Sephora store. Pink Bling is usually sold out...BTW. I was supposed to spend the day working on my blog to get it up to code for FTC guidelines. 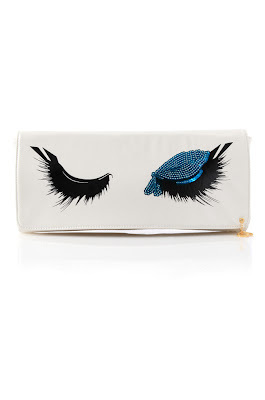 A clutch with Shu-worthy lashes! It is from French Connection and it retails for $78. 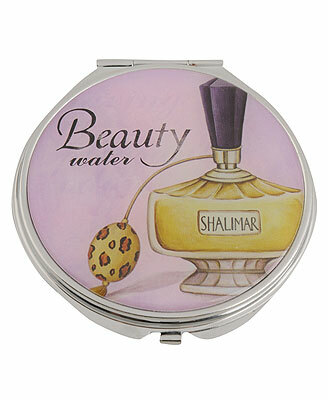 This gorgeous brush collection contains 5 brushes in a cool patent leather clutch-like case. The magenta dipped, dense brushes are snuggie-like soft. The brushes are outrageously handy but it is the deep pink color that makes it a "must have" purchase. They are girly yet hip. The set retails for $59 and is exclusive to Nordstorm. It would make a killer stocking stuffer!